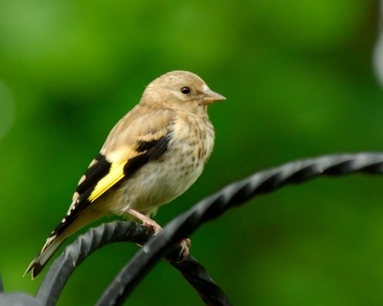 While many young birds are subtly different from the adults, others like the Goldfinch can look quite different. In Goldfinch, the young bird has none of the head colours of the adult. Young birds can have several changes of feathers, from their downy stage into juvenile plumage and into their first year plumage. At the same time as this is happening, adult birds, having raised their young, go into the complex process of renewing their feathers by moulting them. When birds are moulting they are vulnerable, particularly when they are shedding flight feathers and growing new ones. Often at this time, birds do not draw attention to themselves, but make themselves scarce. Most birds are able to fly when moulting, because they shed their flight feathers in sequence, so that only a few are missing at any one time. Ducks and other wildfowl lose all their flight feathers at once and become flightless. Male ducks moult their body feathers before their wing feathers so that they have a more camouflaged female appearance when they are flightless. This is called going into eclipse and gives the birds a very different appearance. Over the summer look out for these “different” birds.